Transition To Winter Decorating! When it comes time to put away the Christmas decor, I find it to be a feeling of cleansing or a fresh start for the new year. This coming week I’ll be headed back home (still up at the beach house) and down come the Christmas trees and the hours of work that went into it all will be a mere memory! It’s going to be time to clean out the closets as well and donate boxes of what has been accumulated and the decor will be light and simple. Here are 5 ways that I transition from Christmas to winter and they are quick easy tips for you to perhaps pick up in your home. 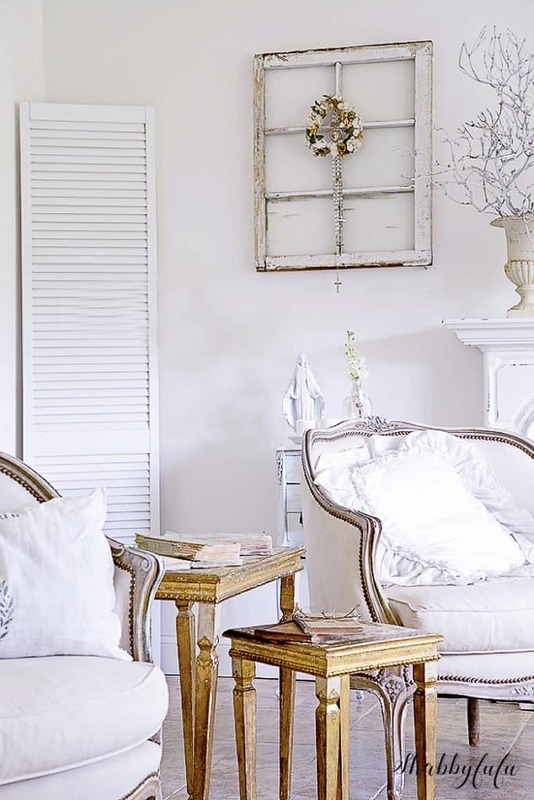 It’s my thing to love white, but I don’t like my home to be a cookie cutter of anyone else’s and neither should you! The first thing that I do when the Christmas decor items are removed is to give EVERYTHING a thorough cleaning. Slipcovers are washed, pillow slips are cleaned, paint is touched up when necessary and believe it or not this rug was dragged outside and washed with some dish soap and hosed off. I LOVE synthetic rugs like this FAUX FLOKATI at my affiliate for the ease of clean up and with white it’s necessary. YES…you CAN live with white! I always use white sheets on our bed for the bleaching factor and the fact that we have 3 dogs who love to jump up and snuggle when they can get away with it. 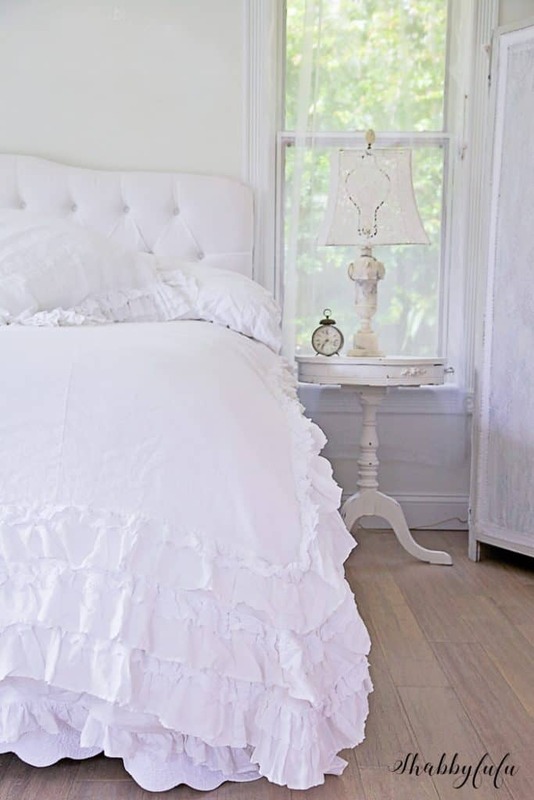 Some of my favorite duvet covers and coverlets over the years have been white and it’s just a clean, lovely look. A well placed architectural piece in either white or grey can bring a winter feel into your home without saying “Christmas”. The white shutter was a curbside find and you can generally source these quite inexpensively at thrift shops. I’ve used mine (I have a pair) to hide “junque” when doing photo shoots, to hanging dresses on and have made dressing screens in the past by hinging a couple of them together. You wouldn’t know that there is an a/c vent hidden behind the shutter in this shot:-). The vintage window adds a bit of a winter look as well and with the wood panes you can tap in a tiny nail and hang jewelry or other bits for display. Do you remember when we used to sell these slipcovers in the shop? 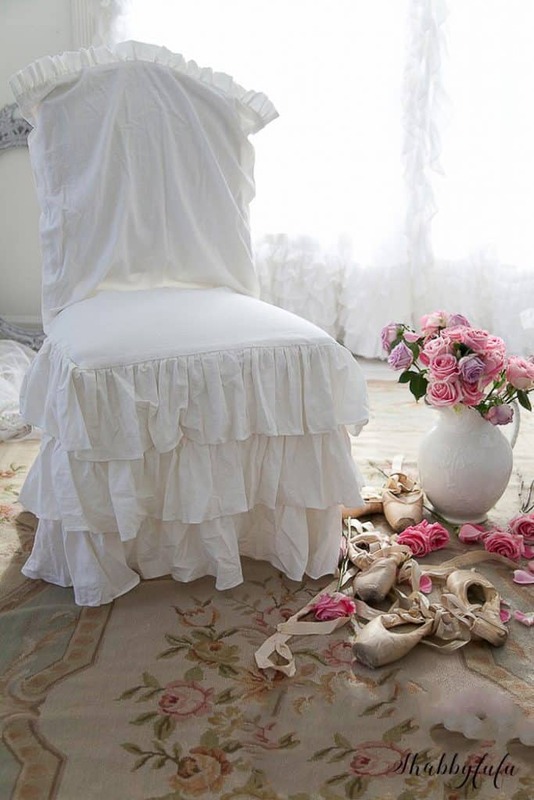 I may bring them back again at some point, and slipcovering a chair or sofa in white is just perfect for a winter feel. Toss them in the wash when dirty with some bleach and for color infusion add some bright pillows if that is your style. 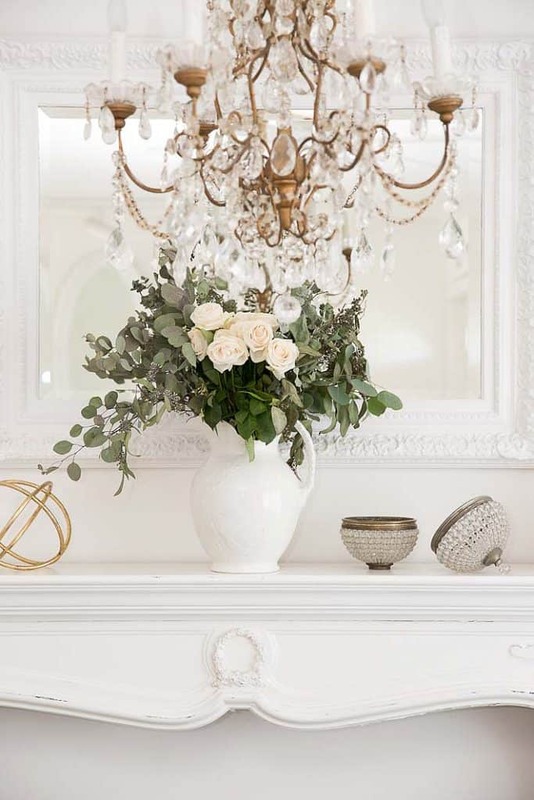 Just because Christmas is over doesn’t mean that you can’t use a wreath in your home! 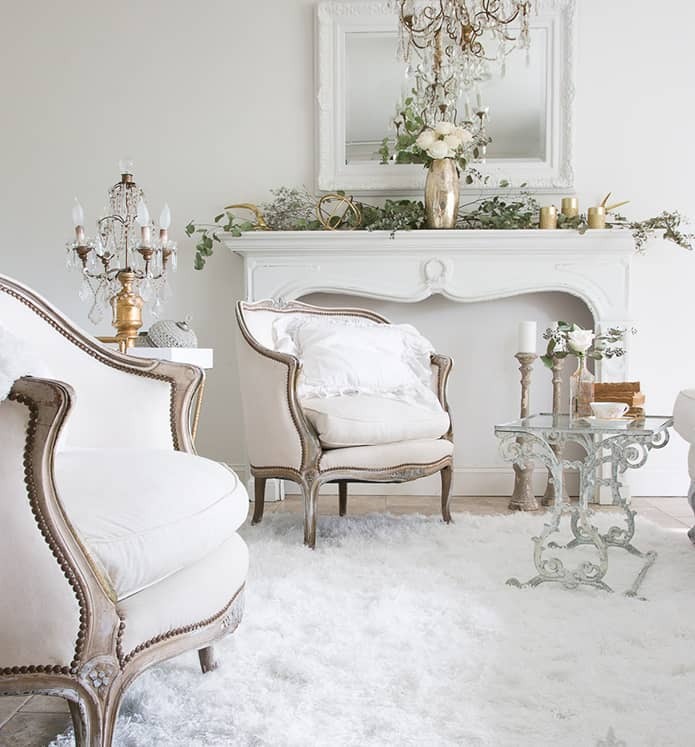 Transition to winter decorating with white touches here and there. 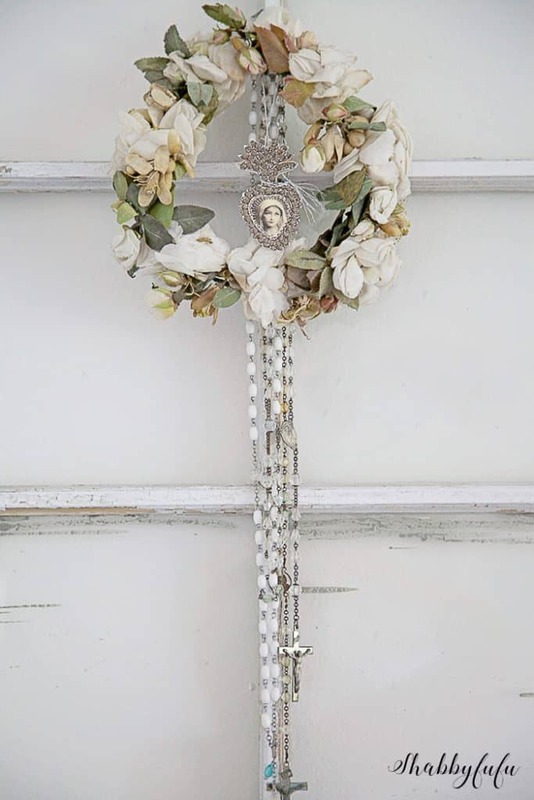 A white wreath made from natural elements or vintage millinery as mine will bring that snowy look indoors. There are so many ways to create wreaths that it’s mind boggling. “Add some vintage white finds” you have a set of nested florentine wood tables…. I have the same ones, with the same wonky slanted foot! LOL! They are one of my favorite pieces of furniture! Happy New Year to you and your family 2 and 4 footed. Marguerite, thank you for stopping by and Happy New Year! I know Debbie….just haven’t found anyone as competent and reasonable to make them. hi I wish you would sell the slipcovers…very hard to find…did not know you sold them before?? I did sell them before Lynda and had them made by a seamstress from my designs. She retired and I just haven’t found anyone as competent and reasonable. Perhaps in the future.